It's time to get schwifty, Rick and Morty fans! Or fans of delicious things in general, because the Szechuan Sauce is official back at McDonald's. The sauce was originally released by the fast food chain in order to promote the release of Disney's Mulan in 1998. However, thanks to the Rick and Morty season 3 premiere, which features the sauce and actually turned into one of the episode's biggest punchlines, demand for the defunct dipping sauce was through the roof. Now, McDonald's has properly answered your prayers and has brought back the sauce. 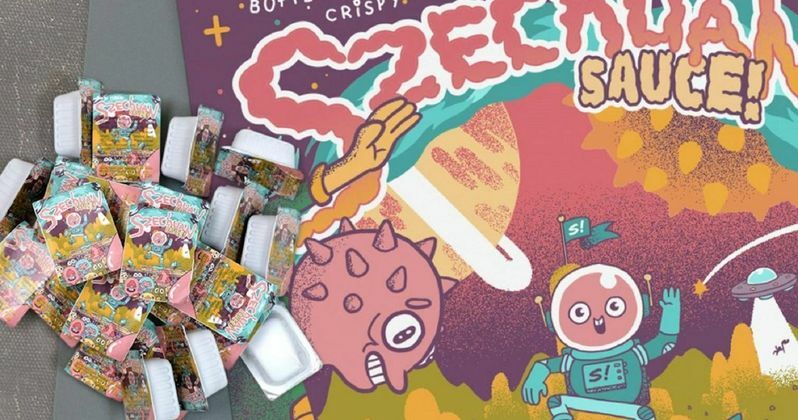 As many Rick and Morty fans may recall, McDonald's released an incredibly limited quantity of the Szechuan Sauce last October. However, they dramatically underestimated the demand, which led to actual riots and thousands of angry fans across the country. McDonald's is truly trying to make amends for that and, starting today, the Szechuan Sauce will be made available at their locations and it sounds like there's going to be plenty to go around. Here's what McDonald's had to say about it in a statement. "Last October, we truly meant well when we brought back a super-limited batch of Szechuan Sauce, but it quickly became apparent we did not make enough to meet the expectations of our fans. We did not anticipate the overnight crowds, the cross-state travel and the amazing curiosity, passion and energy fans showed. Our super-limited batch, though well-intentioned, clearly wasn't near enough to meet that demand. We disappointed fans and we are sorry. To fully make amends, we felt it was important to not only bring back much more sauce this time, but to also admit our mistakes, answer questions and give fans access to the story behind the story." McDonald's will ship 20 million packets of the Szechuan Sauce to their restaurants, so if you want some, there's no need to riot or wait for hours on end. There's a lot of it and Mcdonald's is clearly trying to get some good PR out of the sauce's return this time around. They don't want another nightmare on their hands. Now, you will need to make a "qualifying purchase" in order to get some of the sauce, so don't just walk into a McDonald's in the hopes that they'll just hand some over, but that's not too unreasonable for something Rick and Morty fans wanted so desperately. The fast food chain is really making the most of this whole thing, as they actually produced a series of podcasts called The Sauce that chronicles the "unbelievable, stranger-than-fiction, saga of Szechuan Sauce." All three episodes are available now, if you need a little entertainment to go with your dipping sauce. All of the episodes are available on WeWantTheSauce.com, as well as Spotify, Apple Podcasts, Google Play Music, iHeartRadio and Stitcher. If you're just in it for the Szechuan sauce, best head to a McDonald's near you.